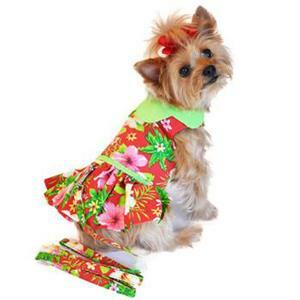 Get your little girl ready to go on vacation with this Red Hawaiian Hibiscus Dog Dress. It is made of 100% soft cotton, Red Hawaiian Hibiscus print. Fully lined for long lasting wear, trimmed with a lime green scalloped collar and matching faux belt, skirt is ruffled. This Doggy dress comes with a FREE matching leash and D-Ring making it easy to use as a harness. when ordering. Leave a small space for movement and possible growth.